I'm trying to transfer (make a copy of) all of the photos/videos in my iPhone's Photos app (what I see under the Photos builtin) to my macbook laptop. 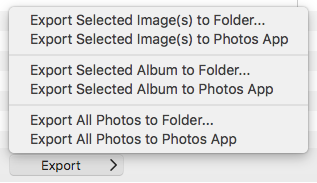 If I go to Photos then "Import New Photo" or use image capture, nothing is available for import potentially because these are no longer on the 'camera roll' itself. What's the best way to do this in bulk? that you don't mind purchasing some software that can help you do this (and more). You can download/purchase Macroplant's iExplorer software. This software has been around for a long time now and generally works very well. Note: Just to be clear, the above screenshot is taken from a Mac with iExplorer installed. I am browsing the iPhone from within iExplorer on the Mac, selecting an album, and clicking on the Export > button. iExplorer also allows you to mount albums/photos as a disk within Finder on the Mac so you can drag and drop files from the iPhone to your Mac. Once copied across you can then deal wth them like any other files on your Mac (e.g. you could import them into the Photos app on your Mac). Below is a screenshot showing right-clicking on the Recorded Videos folder and selecting the Mount as Disk option. Note: Just to be clear, the above screenshot is taken from within iExplorer on the Mac. I have selected the Recorded Videos folder and mounted it as a disk on the Mac. I strongly suggest you check out the iExplorer page because it does a whole lot more than just transfer photos. You can also try it our for free and, if I recall correctly, can transfer a limited number of items. Disclaimer: I am not affiliated in any way with Microplant or the iExplorer software. Not the answer you're looking for? Browse other questions tagged macbook iphone photos.app image-capture . How can I control where photos end up when I sync them to my iPhone? Are there any good iPhone camera apps that properly rotate photos?